The Goniopora Coral is a beautiful species that can look like a bouquet of flowers! The Goniopora Corals Goniopora sp. are very pretty with a distinctive appearance These corals have several common names that depict their appearance. In the wild they are mostly columnar or massive, but some can also be encrusting. Their skeletons are lightweight porous skeletons, but their distinctive features are the elongated polyps topped with a fringe of tentacles surrounding a mouth area. They look much like a ball or cluster of potted flowers. Hence the common names like Daisy Coral, Flowerpot Coral, Sunflower Coral, and Ball Coral. 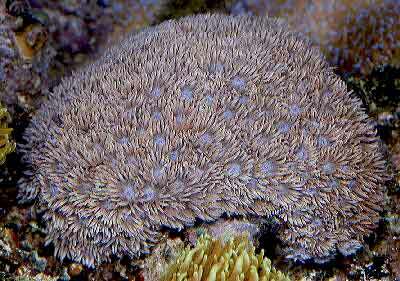 All the different Goniopora species have 24 polyps, but they are usually of different shapes and colors. The Goniopora species extend their polyps during the day, yet are partially retracted at night. An interesting fact is that their nervous system is very intricate. If you touch one side of these corals, it sends impulses to the rest of the coral, and the other parts will pull in their tentacles! Colors the Goniopora Coral come in are usually green or brown, but can be shades from brown to pink, red, cream, yellow or gray. The green Flowerpot Coral G. stokesi, along with the brown G. lobata are the most common Goniopora species found in aquaria. A newer Red Goniopora G. somaliensis has become popular due its pretty color, and the fact that it is one of the hardiest Goniopora species. They G. lobata are about half the price of G. stokesi, but are harder to care for. Currently the G. stokesi is the only free living Goniopora species, meaning it is not attached to the reef. They are found on soft substrates in calm waters. The G. lobata, G. somaliensis, and other species are not free living, but connected to the reef. Not being free living, these corals are broken from the reef. The G. lobata is the least hardy of these three. It is more likely to get infected because of this, and is generally more stressed from collection and shipment. All the Goniopora species are a challenge to care for in captivity. This type of coral is not recommended for beginner aquarium keepers. They have a long a history of being difficult for the aquarist to keep successfully. Many find them don't survive for more than a year, though some experienced aquarists have been successful at keeping them for three years or more. The loss of these corals usually occurs slowly, as sort of a wasting condition. There is a push to try and figure out the right "combination" of light, current, supplements and food needs for this coral due to its dismal record in captivity. Chances of success are greatly increased for the experienced aquarist that is dedicated to acquiring the specialized knowledge and skills, and providing the properly design system needed for its survival. The G. stokesi (Green Flowerpot Coral) can fair better than many. They can handle more light than G. lobata and even be propagated under the right conditions. The newer Red Goniopora G. somaliensis seems to be a little more hardy than the other colors, yet still needs the correct environment to thrive. They need a moderate water flow, water changes, carbonate supplementation, and calcium. They also need to be monitored frequently and kept consistent. A sandy substrate and plant sea grass in the tank has been noted as helpful, possibly from a nutritional standpoint. Goniopora lobata is always broken from the reef. Because of this care must be taken to treat the detachment scar on its underside. This break area is prone to infection. They grow in short thick columns or hemispherical shapes and have large polyps. They come in brown, yellow or green and can have contrasting colored oral discs and polyp tips. They are found in turbid water and moderate lighting is recommended. Light should not be strong as they do not have a high intense light level in the wild. Provide phytoplankton and other very small prey items for food. Easier to care for species in captivity. Goniopora somaliensis is bright red. It is found in Indonesia and it has been popular due the fact that it is one of the hardiest Goniopora species. It is not too picky, adapting to low light, low flow as well as bright light and medium flow. This species will accept small zooplankton. It can be bright red, but most are usually grey. They almost always form encrusting plates with short polyps and cylindrical tentacles. This makes them look like a shaggy carpet. Likely the species in the main picture of this paper, the Blue Purple Goniopora is a gorgeous specimen. They need much lower flow than what is depicted here, which would prevent the coral from hanging onto and getting enough food. Turning off pumps before feeding liquid phytoplankton would be best and not overdoing it with lights, unless you want a bleached out animal. With a mix of pinks, creams, green and white, with small tentacles and polyps, it is easy to see why this was named the Anemone Goniopora. By looking at the massive colonies in the wild, they appear to be anemone like and have typical anemone coloring! Found in caves, it is likely this coral would need heavy feeding and much lower lighting and water flow. Where Goniopora Corals Are Found: The Goniopora genus spans across the Indian Ocean and most of the Pacific Ocean's tropical waters including the Red Sea and the East, West and North Coasts of Australia. Goniopora Coral Habitat: The Goniopora genus are found in a variety of areas of the reef; including low to moderate current, lower to stronger light, and clear to slightly clouded waters. The G. stokesi are usually found free living on sandy substrates. Description What do Goniopora Corals look like: The Goniopora species can form massive or columnar formations, which are lightweight and porous. They are usually green or brown, but can be shaded from brown to pink, red, cream, yellow or gray. The polyp column is at times is a different color from the tentacles and oral disc. Goniopora corals have 24 tentacle tips and their corallites have 24 septa. The tentacles can reach up to 12 inches (30 cm) or more. The polyps extend during the day, yet are partially retracted at night. Their appearance is similar to their close relatives the Branching Flowerpot Coral Alveopora sp., yet the Alveopora have only 12 polyps each. The polyps Goniopora corals are also larger than Alveopora corals. Life span is unknown. The Flowerpot Coral G. stokesi is, at this point, the only free living Goniopora that is not attached to the reef. They are found on soft substrate in calm waters. They are hemispherical or grow in short thick columns with mixed polyp sizes and are generally green or brown, at times with lighter tips to the polyp tips. G. lobata is always broken from the reef and it will have a detachment scar on its underside. This break area is prone to infection. They grow in short thick columns or hemispherical shapes and have large polyps. They come in brown, yellow or green and can have contrasting colored oral discs and polyp tips. They are found in turbid water. G. somaliensis, the popular species is found in Indonesia and is bright red, but most are usually grey. They almost always form encrusting plates with short polyps and cylindrical tentacles. This makes them look like a shaggy carpet. Flowerpot Coral G. stokesi can fair better than other species, and even be propagated under the right conditions. They can handle more light than G. lobata, in fact a photo time of 6-8 hours of 400 Watt 20k German brand Metal Halides was suggested by one aquarist. This has to be done with caution as they can bleach out if it is too much light. Success with moderate water flow, water changes, carbonate supplementation, and calcium need to be monitored frequently and kept consistent. Put on a sandy substrate and plant seagrass in the tank, as it has been noted as helpful, possibly from a nutritional standpoint. Stir up the detritus from your sand bed, since this seems to be another source of nutrition for them. G. lobata is collected from turbid water that is nutrient rich. A medium water flow is required, and with the fast metabolism they have, feeding is important. Moderate lighting is recommended. Light should not be strong as they do not have a high intense light level in the wild. G. somaliensis is bright red. It is found in Indonesia and it has been popular due the fact that it is one of the hardiest Goniopora species. It is not too picky, adapting to low light, low flow as well as bright light and medium flow. This species will accept small zooplankton. Foods / Feeding Goniopora Coral Feeding: The Goniopora corals, like other large polyp stony (LPS) corals, have developed several feeding strategies. Through a symbiotic relationship with a marine algae, known as zooxanthellae, they receive many of their nutrients. They also capture planktonic organisms, food particles from the water column, and can absorb dissolved organic matter. In captivity, they may benefit from liquid nutrients like Marine Snow, Phytoplex, and lipid-rich phytoplankton substitutes. Zooplankton will be accepted, but is not the main food source for them in the wild. Phytoplankton seems to be what 1/2 of their diet consists of. With all of the new plankton cultures that can be purchased, this could be a promising help to keeping them alive. Aquarium Care Typical water changes of 20% a month, 10% biweekly, or 5% weekly are needed. It has been noted that 5% weekly water changes replenish many of the needed additives. With higher concentrations of coral with calcareous skeletons though, there may be a need put in additional additives to maintain proper levels for good growth. It has been noted that Iron and Manganese helps with degenerated tentacles, thus indicating a possible need for these supplements in captivity on a regular basis. Aquarium Parameters A well-feed live rock/reef environment is what is needed for your Goniopora Coral, along with some fish for organic matter production. Make sure they are anchored down well. With their long heavy tentacles, they can "fall" or be dragged into and onto other corals by the water flow. Falls can also cause injury to the skeleton, and eventually death as well. A mature tank is recommended. The Flowerpot Coral G. stokesi, the only free living Goniopora species in the genus, has some other unique requirements, including a sandy substrate. Be sure to have proper water movement and lighting. It has been suggested that a tank without protein skimmers, that do not take out suspended matter or plankton, may be a clue to helping with the Goniopora's survival. Algae turf scrubbers also seem to be a benefit due to the increased micro fauna that results from this type of environment. This is an aggressive genus, and should not be kept in a mixed reef. Compatibility and Social Behaviors Goniopora corals should not be kept in a mixed reef garden. They are aggressive and will sting nearby corals. It is not wise to have more than one species of Goniopora in the same tank since that species will release a bio-active chemical that is toxic to other species of Goniopora. The Goniopora may, depending on the specimen, may accept clown fish. Or on the other hand, they can slowly recede and die from the constant irritation of a clown fish. Goniopora genus will reproduce asexually as well, by budding off a daughter colony. The parent is incused (impressed) with a calcareous nodule that grows until the weight of it causes it to break off from the parent. In captivity, propagation is not suggested. Rather just allowing the asexual production is the most effective and recommended method of propagation. Potential Problems The Goniopora genus is susceptible to brown jelly or protozoan infections, bleaching, and high water flow. Brown jelly or protozoan infections can occur if there is any air trapped in the skeleton, so keep them away from bubbles of any kind. This brown jelly looks exactly like it sounds, and can infect the rest of the colony if not treated. This condition can be caused by poor water quality and/or tissue damage. Symptoms are polyp retraction and a white film covering areas of the colony with necrosis of the tissue. Death usually happens within a few days. You can try to treat this by removing the coral to a container with water from the main display, then brush or siphon off any visible brown jelly. Give the coral a freshwater dip in water with the same pH and temperature as the main tank for several minutes to kill a lot of the microorganisms. Bleaching is common when some of the Goniopora species, mostly G. Stokesi, start to decline. Move them away from the bright light when this happens since they become even more sensitive to the intensity of the light at this point. High water flow will kill your Goniopora within a few months. Availability Goniopora Corals for Sale: Goniopora species, The Daisy Coral or Flowerpot Coral Goniopora sp. are very easy to find at pet shops and on line. Online they can run about $60.00 to $80.00 USD or more depending on size and/or color.